Although I mention “robot integrator” in the title specifically, these principles can be applied to any business within the industry, including: Custom Machine Builders, Controls Integrators, Engineering Companies and more. Fresh out of college, I had the unique opportunity to start a robot integration company. It was incredibly exciting! What chance to get into a high-tech industry, impress girls, make millions, and retire by the time I’m 40! Uhhh well, if you’re in the business you’re probably not surprised to hear that it didn’t exactly play out like that. As my Dad told me early on, “chill out, this isn’t Google.” That’s okay, running my own business was a type of grad school on steroids. Needless to say, I learned a lot. Since then, I’ve started a new venture called FactoryFix, which helps manufacturers find and hire local suppliers for manufacturing, automation and service projects. Now that I’ve been doing something else for a year (albeit still within the industry), I wanted to share my thoughts and tips (especially on marketing) on how to become a stand-out robot integrator. *Although I mention “robot integrator” in the title specifically, these principles can be applied to any business within the industry, including: Custom Machine Builders, Controls Integrators, Engineering Companies and more. I am a firm believer that your company needs a well-organized procurement process. Hire a person that is dedicated to purchasing the COGS for your projects. This position should be an experienced, well thought-out hire, and not just treated as a side job for the receptionist. There is a reason that large companies have procurement teams that are forced to get multiple quotes for every purchase. Vendors hate dealing with purchasing managers, but they’ll pay for themselves in the money that they save. Every dollar of gross profit is critical in this business. The biggest waste of money in purchasing can be contributed to laziness and lack of planning. Any dollars you save in this department are bonus margin points. I’m confident that if your company doesn’t take this process seriously, you could easily pick up an extra 5% per project by getting multiple quotes on things like: machined parts, metal fabrication, prototypes, control panels, and more. Shameless plug – there’s now a website that helps you with that! As the owner/operator, you must keep your company’s cash burn-rate low. Employ a permanent staff that can handle about 80%-90% of your capacity, and develop a process to outsource the rest. Let your new purchasing manager research outside resources that can be ready to help at a moment’s notice. There are inevitable peaks and valleys in the automation business, so you need to make sure your company can survive the downtimes. Your company’s livelihood depends on landing large capital projects that tend to be a nice to have rather than a need to have. No matter what you estimate, receiving a purchase order always takes longer than you expect. The key to success is to stay flexible and never get into a situation where you are turning down a PO because you’re too busy. Keep lean and stay aggressive! Companies are always scared that their target market is too small. My advice is to not worry about it. 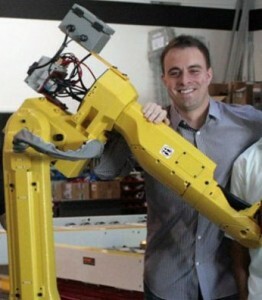 Specialize in one major robot application and become experts in it. Generate content around the application and show your expertise. Become the thought leaders in the space. Flood the internet with videos of your machines, case studies, white papers, and anything else you can think of on the subject. Do everything you can to become the house hold name of a particular application. Two stellar examples of companies who have achieved this are: Acieta and Matrix Design with Machine Tool Load/Unload. Currently, both of these companies have expanded to other applications, but they started with one focus and became experts in their respective fields. When it Comes to Marketing, Play the Long Game! Marketing for a Robot Integrator is not easy, especially when you are just starting out. You never know where your next customer will come from. Shortcuts like Google Adwords, Trade Shows, and Industrial Directories like ThomasNet might be able to get you quick wins, but that strategy is probably not sustainable. Treat those marketing channels as cheating or “growth hacks” while you play the long-game and build your audience overtime. There are no shortcuts to building a self-sustaining lead generation machine. It’s a long-term play but it pays off if you commit to it. So how do you do it? Content marketing seems to be a meaningless buzzword these days, especially in manufacturing. Article after meaningless article are thrown in your face. If I see another dragged-out, boring article on how the “Internet of Things is going to change everything,” I’m going to cry. You need to do something to stand out! That’s how you build an audience and become a thought leader in your space. If you’re thinking that’s not for you because you have great sales reps, you’re simply wrong and nobody can save you. I promise you that anyone can do this. I’m writing this article right now and I absolutely hate writing. Get your smartest people in a room for an hour each week and brainstorm topics that your company knows well. Find a way to create interesting content and share it with the world. Take videos and do case studies on the systems you install. Include permission to do a video in the initial contract with your customer. You can redact the client’s name if it’s a deal-breaker. Once you have a good video, buy email lists of other companies that may need a similar system. Use software such as LeadIQ to find the right prospects right through LinkedIn and scrape their email addresses. Send them the video and see if you get any bites. Distribute your content and videos on social media. Hardly anyone in our industry uses social media correctly, so there is a real opportunity to be ahead of the curve! Facebook, Instagram, and LinkedIn are your friends, focus on those. Keep your eye on SnapChat (seriously), but go ahead and skip Twitter entirely. Believe it or not, one out of every five page views in the United States is on Facebook! However, just posting on these sites to your followers is a complete waste of time. You need to spend a little bit of money and target the correct audience to be effective. I highly recommend two books to help you with this: Content Inc by Joe Pulizzi & Jab, Jab, Jab, Right Hook by Gary Vaynerchuk. Search Engine Optimization. You need to optimize your website to show up in search engines. Make sure you pick keywords that customers might search for when looking for a system that you provide. Use SEMrush to research search volume and help you determine what keywords your company should try to rank high for. Hire a cheap freelance marketer from Growth Geeks to help you with this. Manufacturing partners need you just as much as you need them. Stay loyal because they can really help you in the early days. Your goal is to become an expert in one particular application and lean on them to help give you leads when they come across those projects. If you’re staying loyal to them, you can push them to help you in your marketing efforts. Use them as a resource to share the content you are developing and build your audience! They have a large following and a lot of pull within the industry, so piggy back off that by including their products in your marketing. I’d love to hear your feedback! Reach me at patrick@factoryfix.com or 630.220.4480.